They all start out as pairs—but bookends (and certain other collectibles such as fu dogs) don’t always stay with their mate. 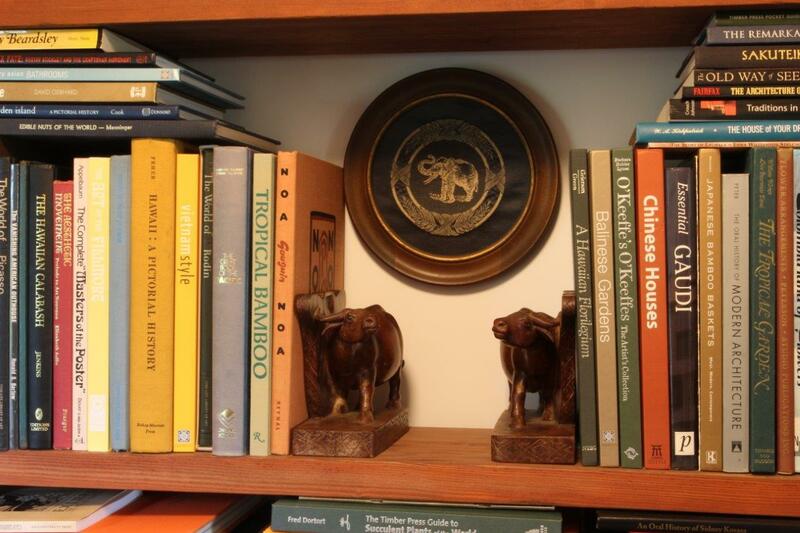 The only feng shui rule about single bookends is: Don’t have them in a Relationship Corner. Other than that, consult the bagua map to know the best place to put them. 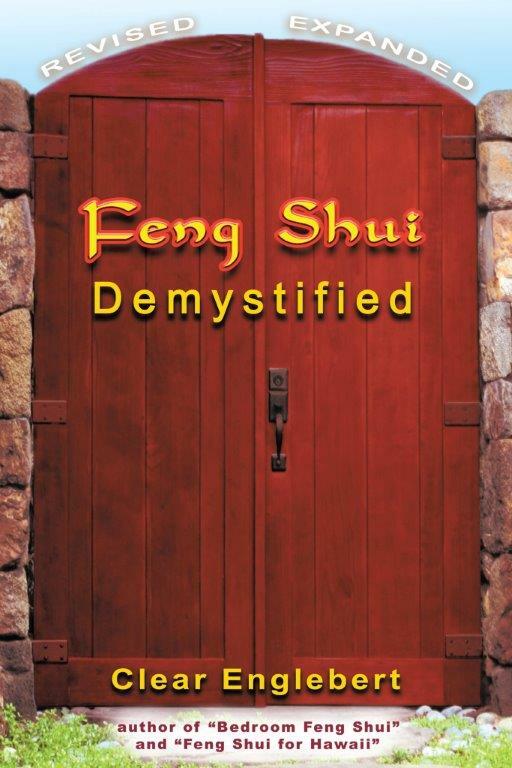 “Best” being the place in your home where their physical qualities of shape, color and material (as well as their metaphorical symbolism) are accentuating that bagua area. That can be tricky because those four qualities can easily conflict with each other. You may have to mull it over to decide if a certain quality predominates. Bookends are often made of metal, wood, or pottery (which is earth), so the material can be one way to approach their placement. Glass bookends can symbolize water or metal. Synthetic materials usually symbolize fire. 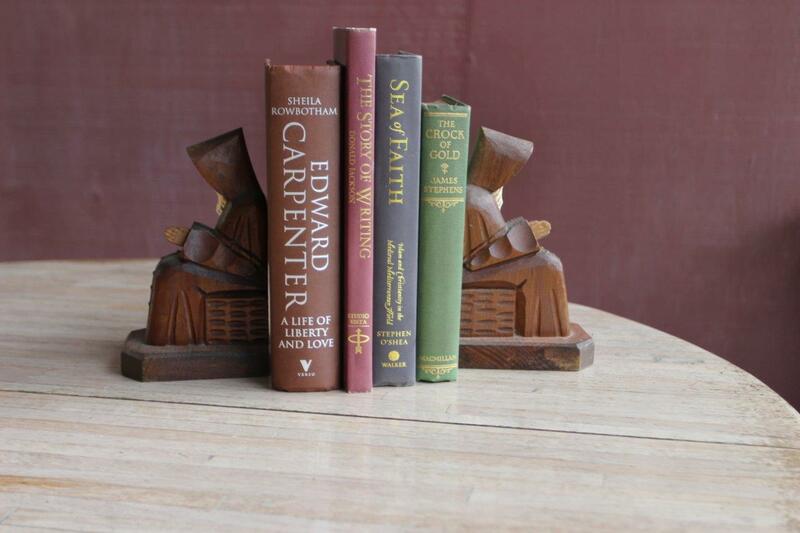 Here are two of my very favorite bookends in my collection—and they’re both singles. The first one is matte white Nelson McCoy Pottery from their Lily Bud line. It’s in the Fame Area of our library because its shape symbolizes plants, and in the Creative Cycle of elements, that’s the wood that feeds the fire of the Fame Area. This bookend was produced in Ohio in the 1940s and yet it has classic Art Nouveau style even though the heyday of Art Nouveau ended around 1910. 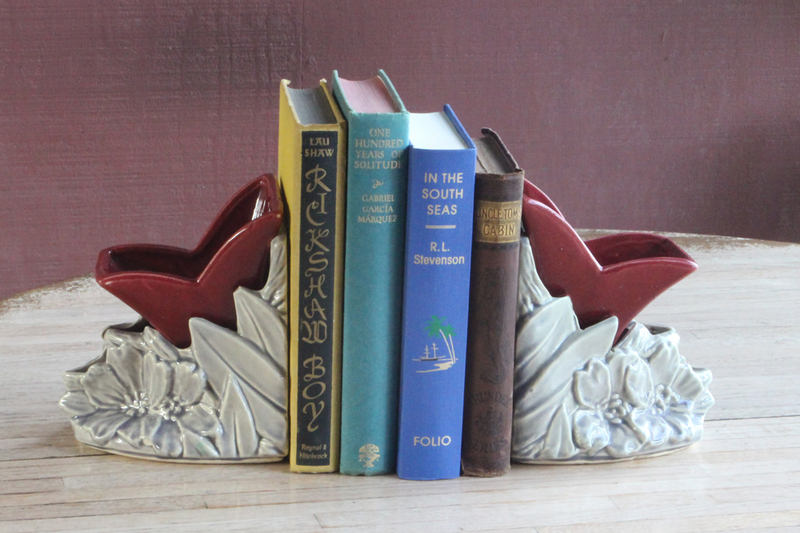 Art Nouveau is my favorite style and, with its graceful shape and wonderful feel, this is my favorite bookend. On the shelf above the McCoy bookend is this Tiffany bookend from the very early 1900s. It’s very special to me. 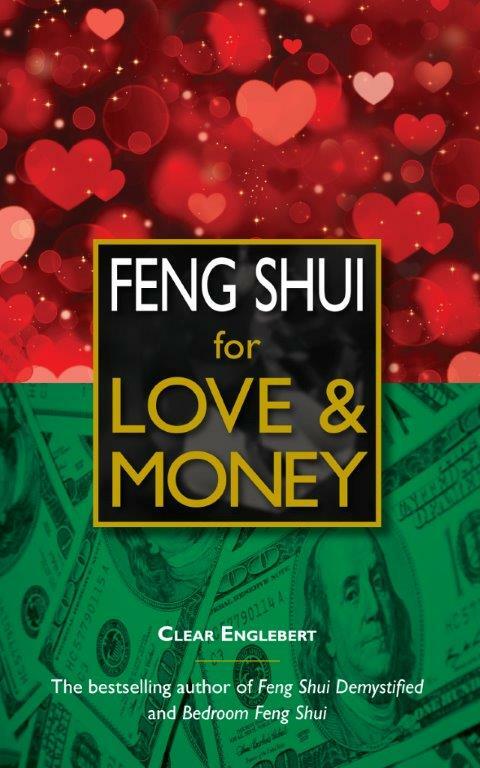 I tell its story on page 76 of Feng Shui for Love & Money. The name “Tiffany” has symbolism that works well in both the Fame Area (of the room) and the Wealth Corner (of the whole house). The third picture shows all three shelves on this side of the window. 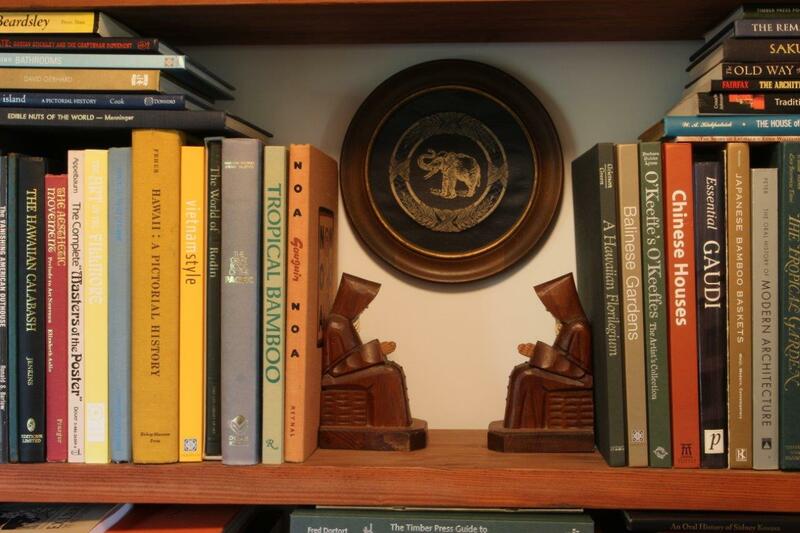 The pottery Kwan Yin bookends (on the lower and upper shelves) are a pair even though they’re kept on separate shelves. They’re grayish blue, glossy and have no manufacturing mark. I feel sure they’re pre-midcentury American made, and if you happen to know the manufacturer I’d appreciate hearing from you. This table, which I’ve borrowed from my Feng Shui Demystified book, may help you figure out how to classify any decorative objects you might have. Water creates Wood, is created by Metal; weakens Fire, and is controlled by Earth. Wood creates Fire, is created by Water; weakens Earth, and is controlled by Metal. Fire creates Earth, is created by Wood; weakens Metal, and is controlled by Water. Earth creates Metal, is created by Fire; weakens Water, and is controlled by Wood. Metal creates Water, is created by Earth; weakens Wood, and is controlled by Fire. With these concepts in mind, feel free to place your lone bookends as you please. Just remember: Keep them out of the Relationship Corner! There is a particular kind of bookend that should never be placed in the Relationship Corner of the house or of a room. I’m referring to a pair of bookends which look like one complete object when placed together with no books between them. 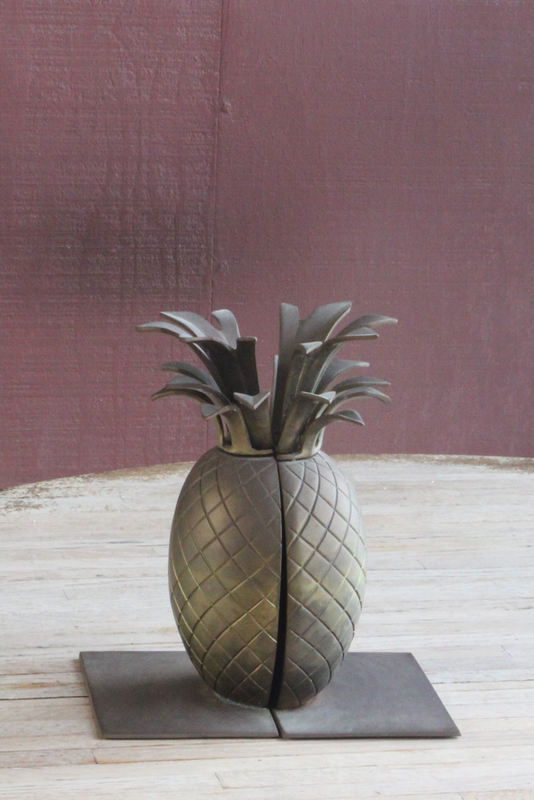 This brass pineapple bookend set separates so each end is half of a pineapple. That’s the kind not to put in your Relationship Corner, because it’s essentially singular — it’s one thing, chopped apart. Because they are metal, I’d put them in the Creativity/Children Area or the Travel/Helpful People Area, where they would be excellent. 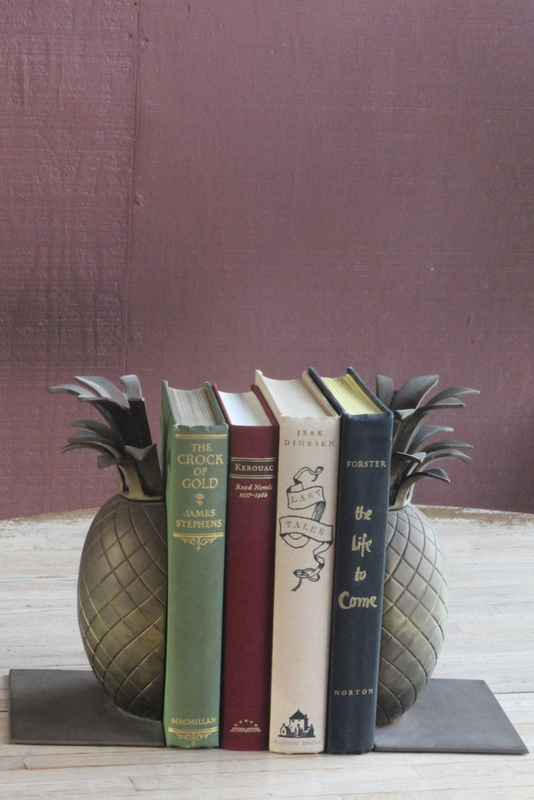 Make sure you position pokey bookends like these pineapples in a place where the points don’t aim at people—which could easily be the case if they are placed on something low such as a coffee table or end table. 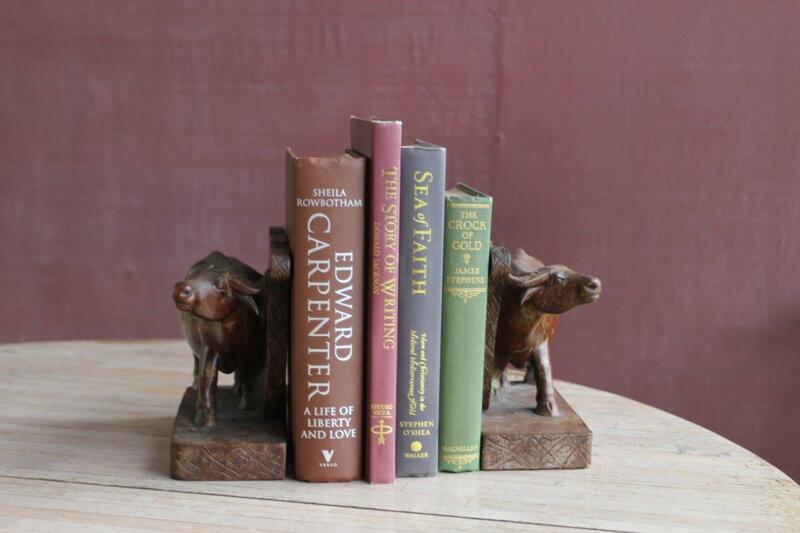 These vintage McCoy bookends are not only cute, they’re perfect for a Relationship Corner—and that’s where we keep them.When the pottery bookends are placed together with no books, it’s obvious that it’s the same thing twice—neither bookend is half of anything. They make up a pair, and pairs are good in a Relationship Corner. Part of the cuteness of this set of bookends is not just the surprising color combination, it’s the silliness of the whole design—at least for me. 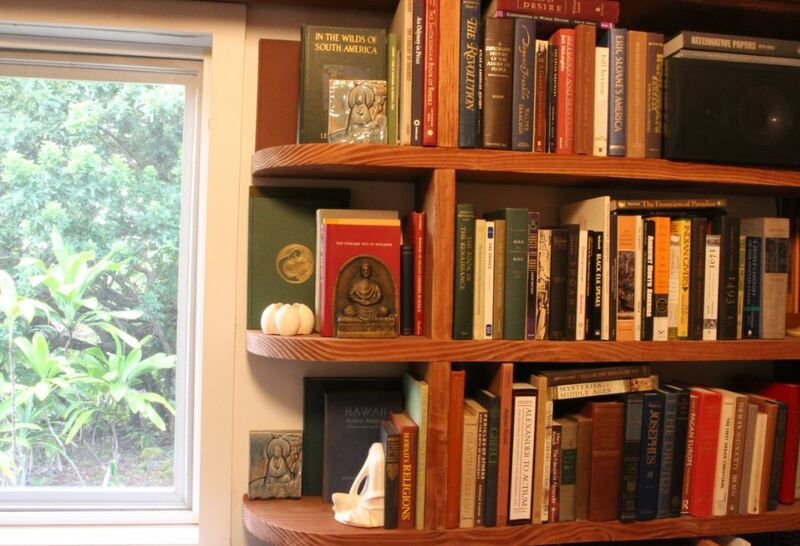 The maroon part is meant to be a planter, or possibly even a vase—neither of which are good to have around books because they add humidity, and books need dry air. We keep clothespins in them because we have a clothesline nearby. 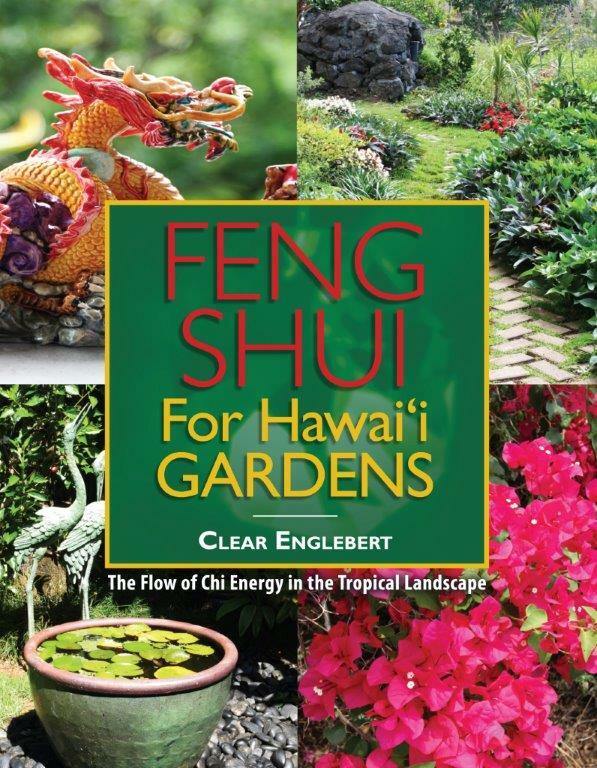 Silk plants of the appropriate shade for the bagua location would also work nicely. Remember to keep them nice and clean. Your home and its contents are a chorus. Every object has a voice; the objects that are out in view have the loudest voices and the most profound effect. What the voices are calling for is certain energy to come into your life. The message depends on the symbolism of the object. Hence a great feng shui caution about unnecessary ornamentation, which introduces symbolism that wouldn’t necessarily be there if the object were unornamented—ornamentation can be a burden. It’s best to know what you’re asking for! 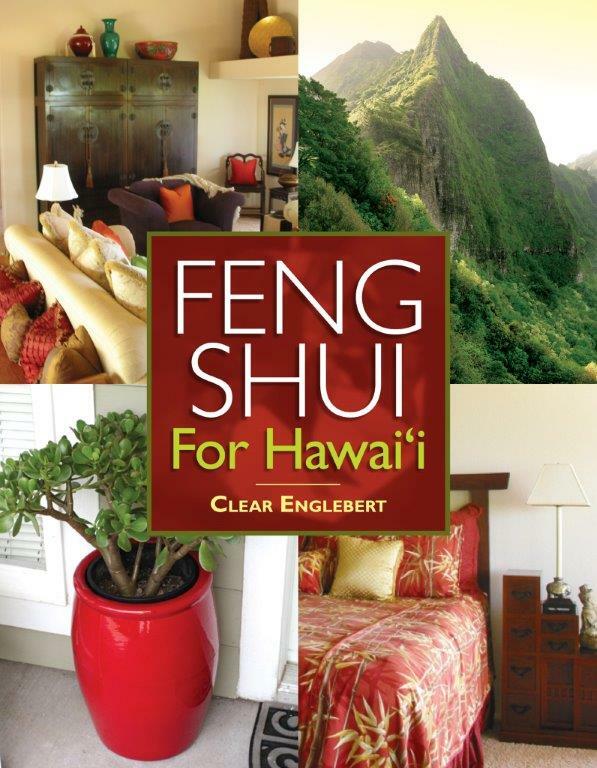 That’s what I consider to be the great gift of feng shui—it can let you know the kind of effect that is likely to show up in your life. 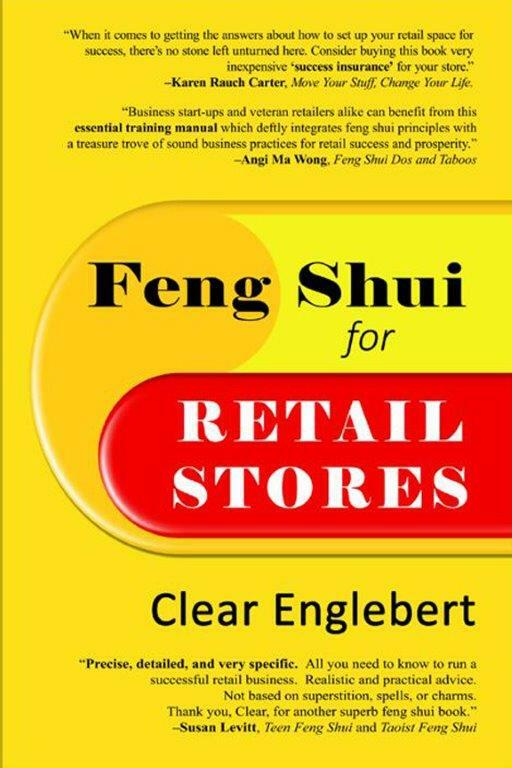 Common sense and intuition are important in feng shui—and so is knowledge of the five elements (which are complex and will be discussed in future posts). Also, the importance of context cannot be overstated. (Context in this case means all the other factors that are going on in and around the home—such as: who is living there, who lived there previously, what’s the place like at night—context can be huge.) 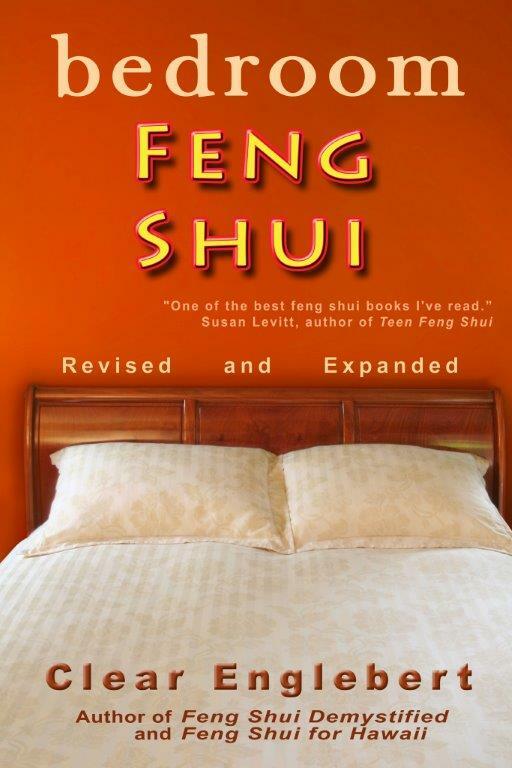 When I consult, I look at a person’s objects and explain their symbolism and how that symbolism affects the area of the bagua of the room or house. Let’s use bookends as an example of objects that call certain energies. A pair of figural bookends might be great in a Relationship Corner, but not if the figures on the bookends are looking away from each other. 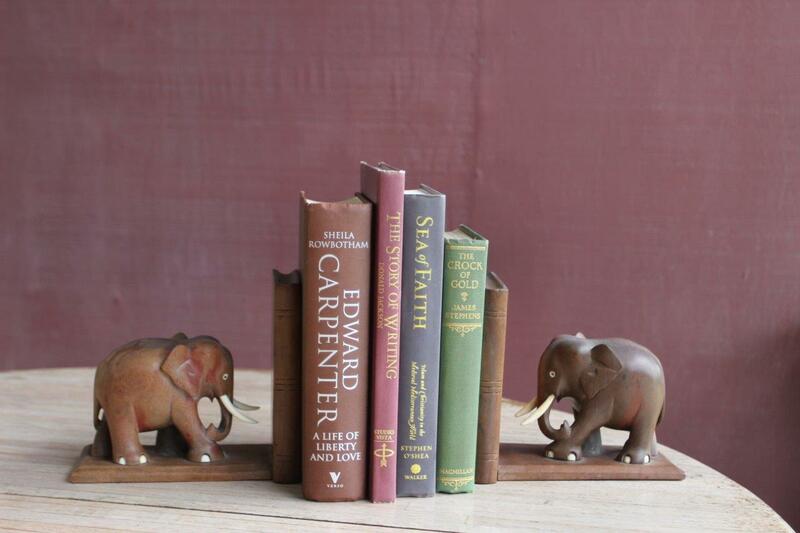 Since the elephants in this photo are looking toward the books they are holding, they are very appropriate for a freestanding book arrangement. These monk bookends are not appropriate for a freestanding arrangement because that makes them look away from each other. These ox bookends are not so straightforward, because even though the oxen are moving in the same direction, they are looking in different directions. 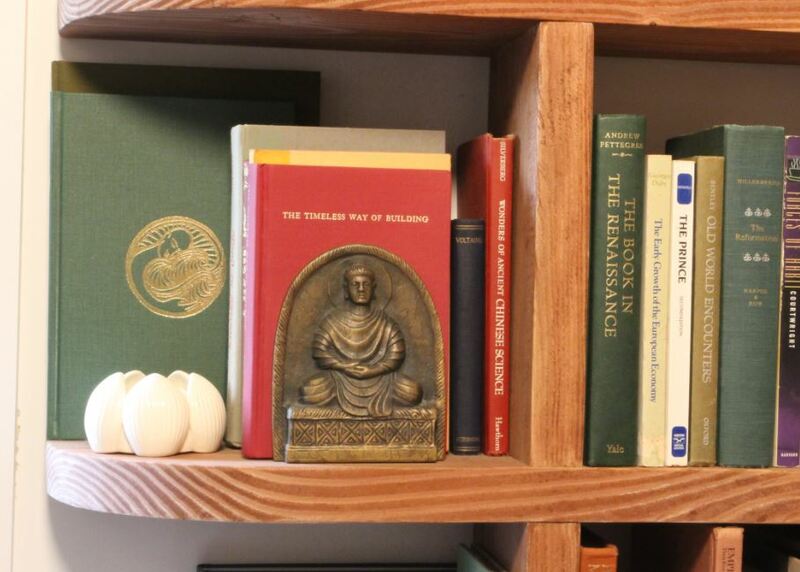 When used in shelving, the monk bookends are perfect to create a break in what would otherwise be a wall of books. Here they create space for a framed elephant brocade, and happily, the monks are looking toward each other. Here the ox bookends are used to their best advantage because not only are they going in the same direction—they are also looking toward each other—nice! The voice of your home itself is best covered in Carole Hyder’s remarkable book Conversations with Your Home. I heartily recommend this book to everyone!